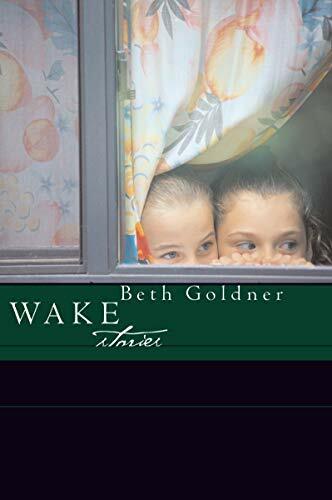 In Wake, Beth Goldner's first collection of stories, the author presents us with a range of characters whose lives are connected by loss, a yearning for love and by Goldner's distinctive authorial style. The large scenes of love and loss are illustrated with the mundane minutiae that stares you in the face at life changing moments. A man calls his wife to ask her to buy coffee, and hears the car crash that causes her death; a woman reads an airport paperback as her fellow traveller's life dissolves into panic. In most cases the path to love is anything but smooth; in many it remains unfulfilled. The stories are spread over a range of locations: Philadelephia, London, Greece, Italy. The characters are similarly diverse: a manicurist, a disabled welder, an editor, a number of children who observe their parents' lives. All are beset by conflicts that Goldner evokes through deft use of dialogue and sparing descriptions. Stories shift back and forward in time as characters reflect on their current lives in relationship to earlier incidents and experiences. This allows Goldner to cover long periods of time in brief vignettes, adding a depth of perspective to strong characterisation. The stories are quirky, and wryly observed. How many women set out to be 'farm wives'? How many men seduce their fiancé's brother on the eve of their wedding? How many dying wives carefully groom their replacement? Goldner shows us all these characters, and more. There's a fragmented feel to some of the stories. A magazine is picked up and discarded, people hove into view then disappear, there are chance conversations that capture a word or a mood. In some stories Goldner throws image after image at us, like a ride on a downtown bus. A lot of people die. Parents, lovers, husbands, wives. Their deaths propel survivors and observers into new lives and new relationships. The only story that didn't work for me was 'Outcomes', a story about a hospice worker. While the situation of this story is genuinely moving, the character of the hospice worker felt observed, rather than experienced. She learns too fast, is too knowing of the details of death, and too involved with her work for the novice she is cast as. My favourite story was 'Waxing', a redemptive tale of Peggy, a woman coming to terms with her own past, and her daughter's commitment to helping the down and out. Peggy is a beautician brought unwillingly to provide a free manicure for Kay, a former addict with AIDS, who has broken nails and brown teeth. Yet in a brief time Peggy comes to understand Kay, and to feel concern for her plight. It's powerful, but not sentimental. Conflicts are not always resolved in these stories. In many cases they are left hanging, and I found myself turning the page for more. When it works, it works well. In Plan B a woman obsesses about the four rings she heard on the aircraft intercom, a proxy for her failing marriage and guilt over a secret abortion, grief for the loss of her twins. This is a tense and compelling story. The four rings mean disaster, the captain is lying, the plane is doomed. When the woman stands to march into the cabin and confront the crew, the flight attendant's 'Can I help?' is the perfect focus for her alienation and loss. It's pure Carver. In another story, Badass Bob, apparently an ineffectual victim, finds himself in an unusual and unexpected way. Wake is a strong collection that takes the reader to many places, and sees the world from a range of perspectives. It is a sensitive, ironic, and witty look at ordinary lives and their extraordinary struggles.